FREE dynamic gate VST/AU, FREE samples, VIDEO for EVERY tutorial, and more! VIDEO for EVERY TUTORIAL, 40+ VST/AU plugins for FREE, 900+ samples and more, with Vault download for whichever format you choose. Bring those awesome sounds out of your head and into reality. In this month's main feature, we'll show you how to synthesise, bend, twist and manipulate sound to your will. Not only will you discover professional sound design techniques, but we'll give you the skills to go further and make your own truly unique creations. • Gate processors are usually pretty basic, but G8 CM doesn't play by the rules. Besides comprehensive, detailed gating controls, this exclusive plugin from Unfiltered Audioeven gives you MIDI input and output for a huge level of control over anything you care to connect it to. 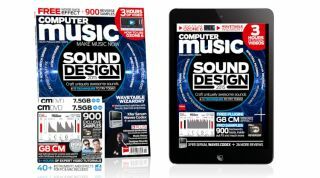 Get this free software with this issue of Computer Music. See how it works in this tutorial video and read the full specs on the G8 CM page. • If you've not tried iZotope's brilliant processing suite by now, it's the perfect time to feel the power. We'll show you around Ozone 6's revamped interface, explain what those knobs and sliders actually do, and go through its advanced processor modules so you can hit the ground running. • Get the lowdown on today's top wavetable-powered synths and conjure up sophisticated modern tones with wavetable synths like Xfer Serum, Tone2 Electra2 and Dmitry Sches' Diversion. Explore the principles of wavetable synthesis, create your own wavetables, delve into graphical editing, and make complex modulation routings to get a sound that's totally your own. • 900+ skewed loops, hits and FX to inject 'that' sound into your tunes. This exclusive sample pack gives you reversed rhythms, backwards basslines, sucking cymbals, flipped FX and loads more. If you're looking to add an edgy sense of interest to your latest tracks, dip into this huge treasure trove of sounds, yours for free with this issue! Designer Sounds: See how Mefjus makes FM8 kick drums - our resident expert InsideInfo reveals all! Tube and Berger: The ever-changing duo tell you how they craft their hit songs, discuss gear and playing live, and what's next for them. Arturia: Technical Director Adrien Courdavault talks software formats, the benefits of increasingly powerful CPUs, and strange requests for software. Joris Voorn: The DJ and producer spills the beans about what music software he uses the most.